Norma is proud to announce the new line of electronics stands, the REVO STAND series. These refined design creations are born from the will to offer a deserving mate for NORMA electronics, celebrating their original aesthetic layout through a top-notch product, both for construction and versatility. 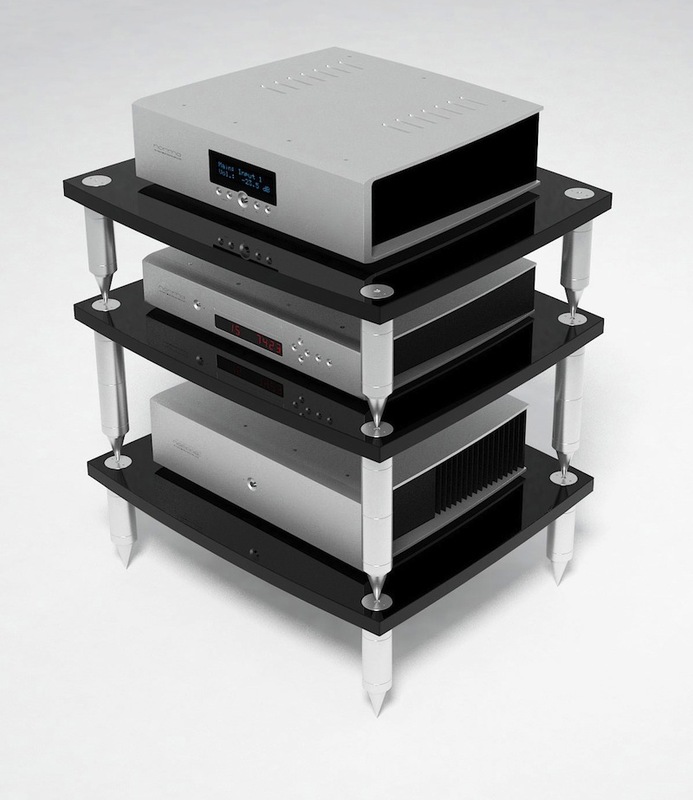 They are completely modular stands, in which every shelf can have an independent height (adjustable in steps of 2.5 or 7.0 cm). 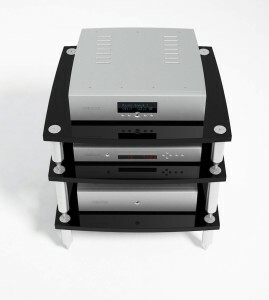 The single shelves can be placed directly on the floor, in case for example of monophonic power amplifiers that need to be placed near the speakers, or they can be mounted one on the other, to build the classic rack. It’s interesting to note that the user can vary at any moment the height of the shelves, by adding or removing spacers. The shelves are built of 25 mm thick MDF, while the vertical elements are made from stainless steel bars, realized from a single block of steel and worked to a fine satin. A clever system of male/female threads lets the user personalize the net height in a robust and practical way. To preserve the floor surface, dedicated tips to be placed under the footers are available. Shelves are available, as standard, in a grey finish, made with metalized anthracite grey paint with transparent finish, characteristic of the best automotive paints, which confers to the stand and to the products on it an extraordinary stylistic synergy. Music reproduction devices become then precious furnishing elements, not to be hidden bu to be shown for their refinement. Shelves were contoured after the innovative shapes of the REVO series, characterized by the peculiar direction of the back lines. To achieve maximum versatility and toughness, the stand was conceived with four legs. This uncommon and rare solution – more expensive than the classic single back leg – presents various advantages. Firstly, it enables to contain the deepness encumbrance of the stand, facilitating its insertion in the ambience. Plus it has the incontestable advantage of leaving the whole back part of the device free, so tat all the necessary cables can be easily placed. In fact, in three-leg stands, the back leg often interferes with power supplying connections, often placed right in the middle of the device. Thanks to the 4 supporting points adjustable in height, the leveling of the stand can be easily adjusted to compensate for floors that are not completely plane. We are sure that who owns and appreciates NORMA products will find this REVO-STAND line very interesting. But also who doesn’t own a NORMA device yet, and appreciates design objects, will not be able to remain indifferent. 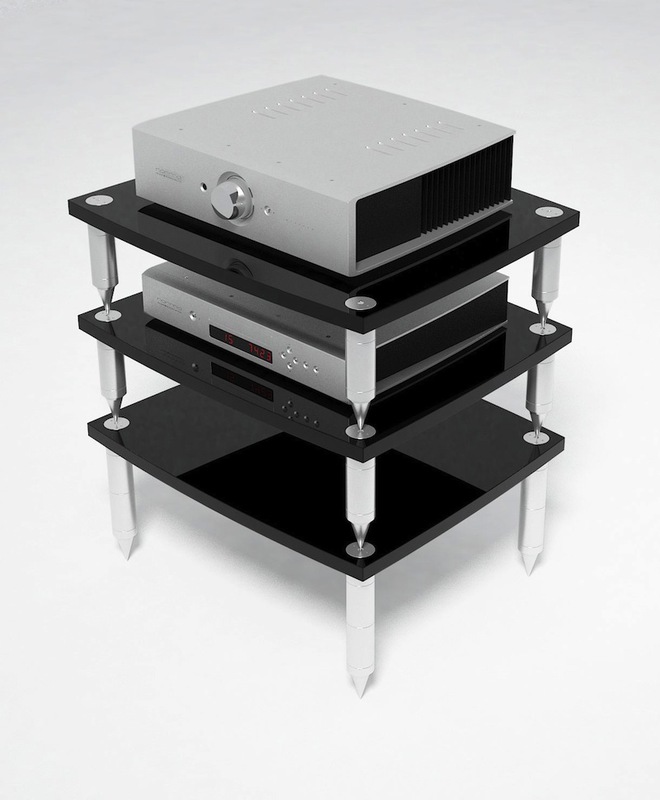 - 4-feet structure, with the back ones placed at the extremes, to achieve optimal access to the back of devices.